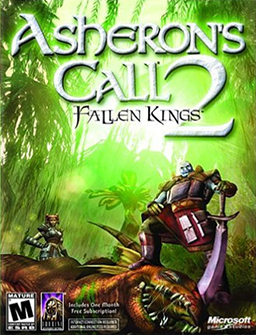 Asheron's Call 2: Fallen Kings was a fantasy MMORPG (massively multiplayer online role-playing game) for Microsoft Windows-based PCs that was released on November 22, 2002 and shut down on December 30, 2005. It was a sequel to 1999's Asheron's Call, although content, graphics and gameplay dynamics differ greatly from its predecessor. Both games were developed by Turbine Entertainment Software and originally published by Microsoft, until Turbine purchased the Asheron's Call franchise in December 2003. The Microsoft to Turbine transition was completed in spring 2005. In 2004 and 2005, Turbine entered business arrangements with Jolt Online Gaming to operate AC2 in Europe and with Sony Online Entertainment to distribute the game's first expansion, Asheron's Call 2: Legions, under the Station Publishing label.